This pistol magazine pouch from Blackhawk's S.T.R.I.K.E. line will hold one double stack pistol magazine or one or two single stack mags depending on thickness. It is MOLLE (Modular Lightweight Load-carrying Equipment) compatible for maximum flexibility with a variety of tactical gear. Each pouch is woven from sturdy 500D ripstop fabric and uses a thick flap and hook/loop fastening system for positive retention of the magazine. 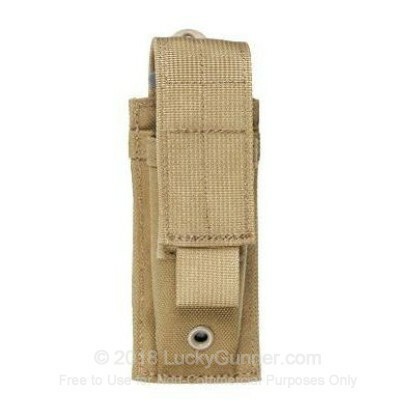 This particular STRIKE pouch comes in a Coyote/Tan color that will match a variety of popular desert and sand colored MOLLE bags.